It seems to me there just hasn’t been enough attention to dessert around here lately, so today I decided it was time for something not only sweet, but pretty to look at too. Lately I’ve had pavlova on the mind … pillowy confections of whipped egg white and sugar, gently baked until cripsy on the outside and marshmallowy chewy on the inside, topped with something delectable. So elegant, so easy! 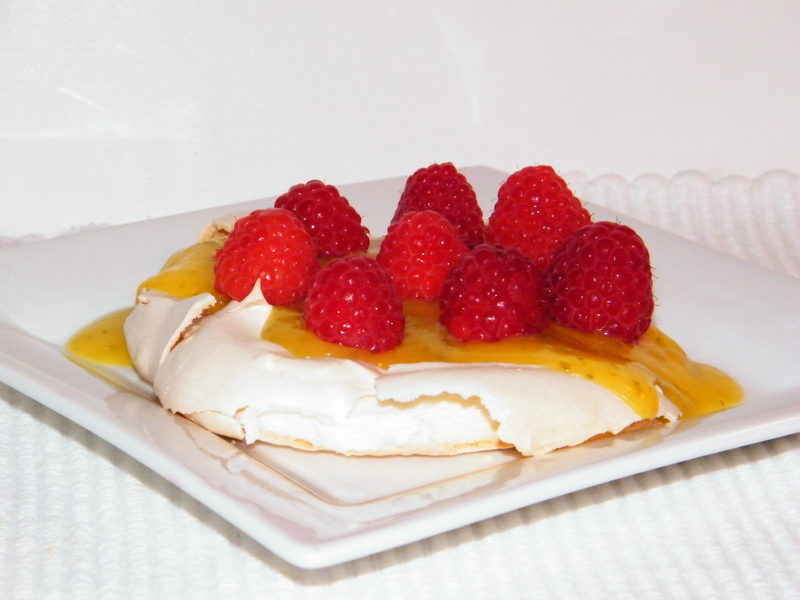 Typically, I top my pavlovas with whipped cream and fresh fruit like strawberries. This time I hit upon the idea of lime curd, intensely flavoured and sweet, with a crown of jewel-like raspberries for extra colour and tangy freshness. For birthdays and dinner parties, I often make a the pavlova as a single 10-inch tart. Since it was just two of us tonight, I decided to make 8 individuals meringues that I can store and lavish with topping as the fancy strikes me over the next few days. Whip the egg whites with cream of tartar until foamy, and then gradually add the sugar and whip until you achieve dazzlingly white stiff peaks. Fold in the cornstarch and vinegar. Divide the egg whites onto the 8 circles, then spread each to fit the circle. A bit of a sticky exercise, but quite gratifying. Pop the trays into the oven, and bake for 30 to 40 minutes. They will be very lightly tanned when done. Remove from oven and cool. You can prepare these ahead and keep in an airtight container for a few days, which is a good way to add an easy dessert to any dinner. Use a zester or rasp to remove the zest from the limes, being careful not to cut off the bitter white pitch. Put the zest and sugar into a food processor (my mini was perfect for this) and process until the zest is finely minced. The smell of the limey sugar is heavenly! Squeeze the limes to make 1/4 cup of juice. Cream the butter and sugar mixture in a small saucepan, stir in the eggs, then the lime juice and pinch of salt. Once this is mixed, cook over low heat, stirring constantly for about 10 minutes, or until the mixture is thickened. Pour into a bowl, cool on the counter for a while, then cover and put into the refrigerator to cool thoroughly and thicken further. Place a meringue on a dessert plate, top with a generous dollop of the lime curd, and garnish with the fresh fruit of your choice. 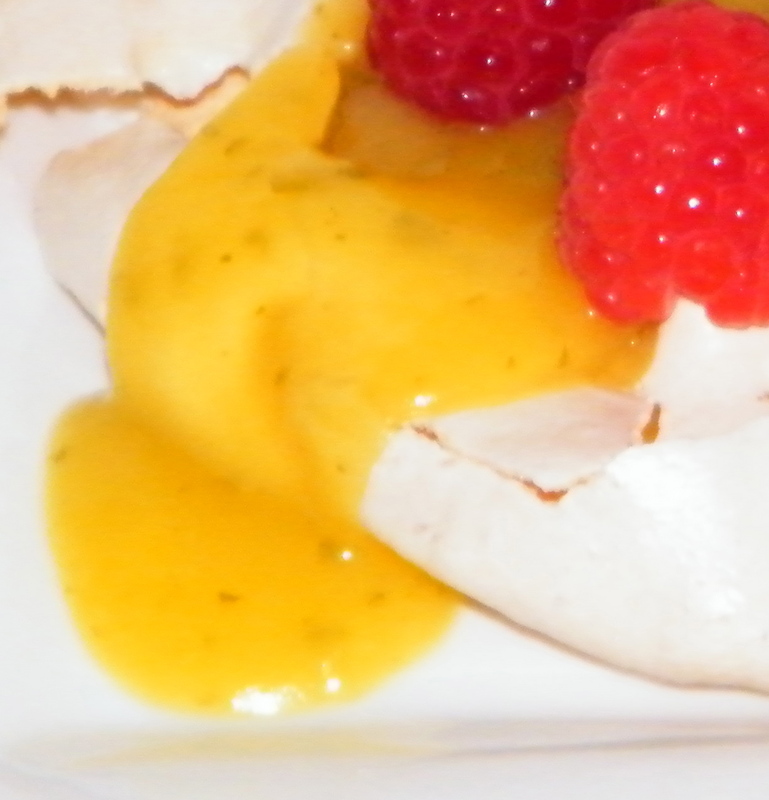 The raspberries I choose today were the perfect foil for the sweet citrusy flavour of the lime curd, and the sweet chewiness of the meringue. It is a quite sweet dessert, with an explosion of bright and fresh flavour. It’s also a feast for the eyes – pale meringue, the golden-green lime curd with flecks of green zest and the crimson pop of the raspberries. I hope you’ll enjoy it as much as we did! Next It’s All in the Name: Chicken Sauté au Vinaigre, or Ketchup Chicken? The sauce on this fabulous desert has the most amazingly lime flavour but it is also sweet!!! I think it’s the perfect combination!!! Bravo!